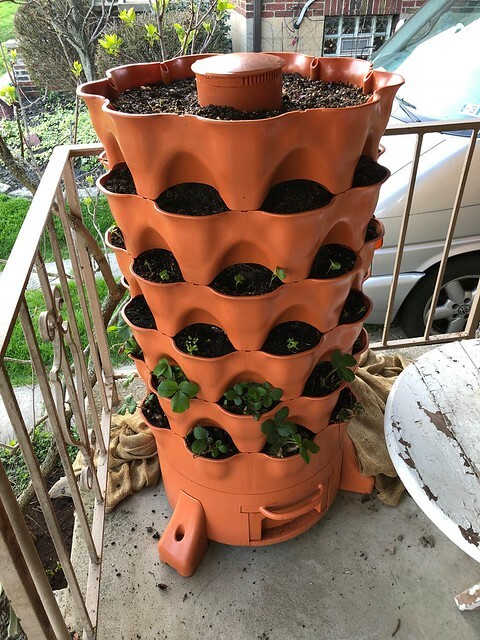 So I have one of these Garden Towers. They now make them with caster wheels. Mine doesn't have wheels. I looked around for planting ideas. I am not impressed with what I've seen so far. It is a giant strawberry pot. You shouldn't plant dill which gets to 3' tall in one of the slots. Sure you could, but how awkward! The tower spins so you can turn which side faces the sun. Also easier for watering, but turning it with a three foot plant sticking out a side, just no. So I've been looking for ideas of food plants that are mostly the same size. It's Appalachia; there are hills. Things on wheels are not so good. It could live in the garage and get scooted out onto the small ledge of flat before the steep incline. It might fit. But the garage is not heated either. But it could work there. I didn't get the wheels but it should have something like that. There are wheels for various bedframes we've owned over the years. You know - in that junk drawer we all have somewhere in the house. Maybe in fall I'll see if they fit. But for now, I am trying it out on the front porch. It's easy to remember to water there. My seedlings go out daily so they all get care at the same time. I have other pots of plants that get totally forgotten just because their location is out of sight. Why would I want a garden tower in my garage? Well, I planted June bearing strawberries in it. They are perennials. I live in a cold winter climate. Strawberries in the strawberry pots all died after last winter. I don't want to loose these plants. I have so few. I found one plant under a rose bush 25 years ago. I put it in a planter near the house drainpipe. The mother plant in the pot died but the baby shoots moved behind a rain barrel. Shade, wet, and crappy soil, they survived but don't flourish. 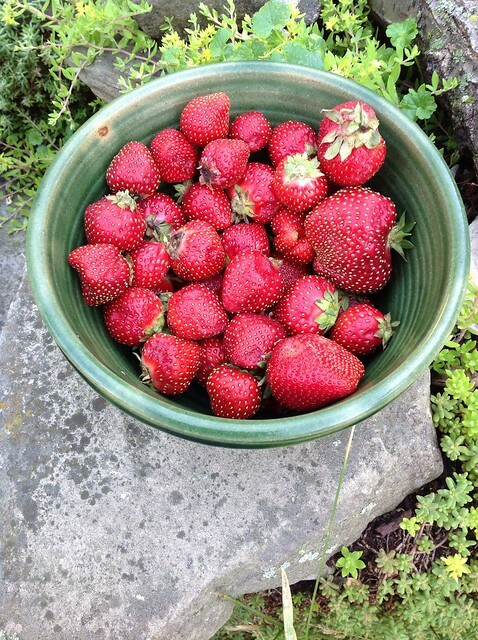 Last couple of years, the strawberries tried to make a break for it and escape into the lawn. I managed to find 18 plants to put on the bottom two layers of the garden tower. One or two may not make it. They were transplanted in winter. I taped a dry cleaning bag around them during the colder days and covered them in burlap. So I would like them protected without having to dig everything up and transplant in fall. The berries are big, juicy and very tasty. Unfortunately, not as abundant as these which we got from the farmer's market. Hoping to change that by using the garden tower. I chose to plant in layers so each round has the same crop. There are nine slots per layer. The next layer has lettuce. The lettuce is a butterscrunch we got from the store last year. After eating it, we were able to reroot the head in the front yard. It went to seed. I cut the seed stalk, flipped it upside down into a bucket and waited until it all dried. I now have a bucket of seeds that didn't get blown away. I suppose a paper bag would have worked too. Not a bad investment. Organic produce has advantages. Looks like seven of nine seeds have germinated. I should plant more in the holes. I'm hoping these don't cover the opening so tight that I can't water them. They are a head lettuce, not a loose leaf. In the next layer, going up, I have French Breakfast radishes. These are a quick crop, 45 days. They should be ready by Memorial Day. Very pleased with the seed. It has an excellant germination rate. The seed came from MI Gardener, home of the 99¢ seed pack. I'll probably put loose leaf lettuce in after the radishes. Going up another level, I put in Beets, mixed colors, from Renee's Seeds. So far zero germination. We did get some last year so it just maybe a matter of temperature. The weather isn't settled yet. It's going down to 39° each night this week. So that brings us to the top layer. It's open. I could plant taller plants. I still don't want to. Aesthetically I think plants should be roughly the same size, not to mention, they could get clobbered by the porch railing as I spin the tower when watering. Yes, and the porch has hanging baskets. It could be bad. So I put in four Mizuna and some Johnny-Jump-Ups. They have yet to germinate. I worry that under the awning on the porch doesn't get enough sun. It's a good place to start seedlings or harden them off. The PVC has bigger plants like Bok Choy. 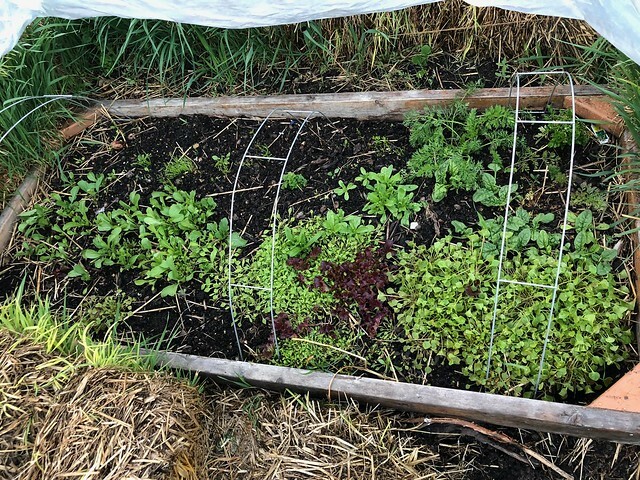 Plant selection is a cross between square foot gardening, spacing-wise and height listed on the seed package. So far, I have come up with radishes, beets, lettuce, Parisian carrots, strawberries, spinach, maybe cabbage or ground cherries on top. Smaller herbs would work too. So far these are the only ideas I've seen. I have a window box to fill as well. If you have any suggestions, please let me know. In order to meet my goals, I need to maximize yield. Maybe Claytonia and Mache for fall? They are small and reseed. I have some in the winter garden.